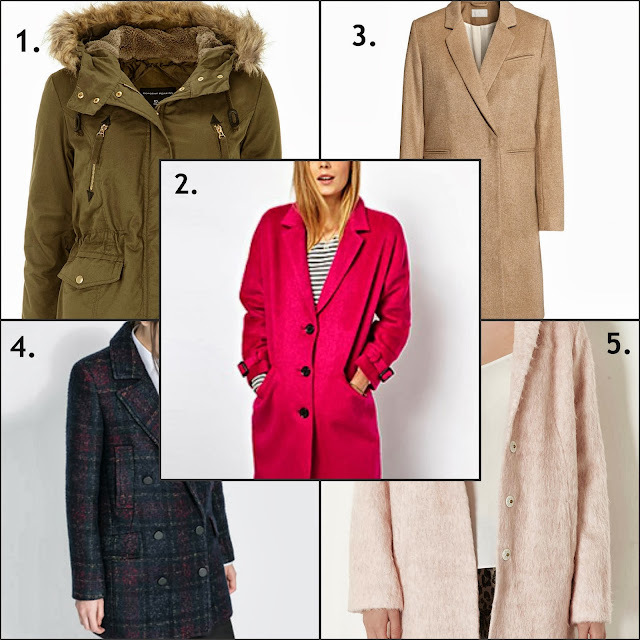 Blondie's Style Fix: It's time to wrap up - Coat Wishlist.. It's time to wrap up - Coat Wishlist..
A little update from me first. I've been on stage all week, performing in a musical production of Carousel! It's been such an exciting week, however everything has been on hold, so I now have a lengthy 'to do' list to compete with. Hopefully you'll forgive me for today's short an sweet 'wishlist' post, as I'm excited to show you some of the beautiful textures and colours of the coats currently hitting the high street! 1. Khaki Short Parka £55 - Dorothy Perkins. If your looking for a coat which you can thrown on during a Autumn shopping trip, and want it to last right through to spring, then I'd definitely recommend a parka style coat, as they're great 'all year' jackets. I particularly liked this one, as it's got fur inside, and a hood to dodge those typical UK showers.. So pink has taken over this winter, and this over sized detective style coat has to be my personal favourite, as it will look effortless with rolled up jeans. Think modern barbie, and be daring with splashes of yellow and pink - yes I've seen it done! I love the H&M basic collections, and their range of coats never disappoint. This coat will really give your winter wardrobe a vintage twist and if you love the 'oversized' look (which is always a great excuse to wear Grandad jumpers) this coat will match up with some patterned trousers and thick boots. Another huge trend this winter is Tartan (and not just the kilt sort). If your looking for something that looks good now, but will stay on trend next year, then this checked coat is perfect - plus the quality of Zara coats is amazing, so no frost bite for you! Finally, how could I miss out this Fluffy pink coat from Top Shop, I warned you Barbie was cool, and well for ultimate warmth there's nothing better than a fluffy coat (am I right). Have you brought your winter coats yet? My wish list could be so much longer, but I'm still clinging to last years coat until payday! I love the first coat! I used to have one just like it & now I'm searching for a new one! I have just bought a coat like the first one but mine has leather sleeves.